For our fabulous new challenge today, we'd like you to create a card or project ..
We chose this theme as it's Mother's Day in March here in the UK - but this challenge can include any creation for a special lady - for whatever occasion. Don't forget our number one rule, that you need to use MORE PINK THAN ANY OTHER COLOUR (with the exception of white and neutrals of course), otherwise your entry may not be considered. Our fabulous sponsor this time is All Dressed Up - you could win two digis of your choice if your name is chosen at random from our Perfect Pinkies. 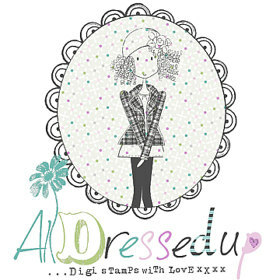 Thanks so much to All Dressed Up - take a look at their website to see the gorgeous digi images available - you can go straight there by clicking on the logo above. So let's see what you can come up with for our 'FOR A SPECIAL LADY' challenge.. in PINK of course. We can't wait to see what you make - thank you all once again for your wonderful support for our lovely PINK challenge! Great DT samples. Thanks for the "special lady+pink" challenge. It was fun to play!